We provide HVAC heating & cooling services for Plymouth MI 48170. AC repair, furnace repair, furnace replacement, air conditioning sales and service for Plymouth MI. Proficient Heating & Cooling specializes in air conditioning services and HVAC repair. We are a locally based, family owned ac replacement and repair business with over 23 years of experience in the field. Our promise to you is superior service, competitive pricing and honest HVAC assessments. We provide a c repair and ac replacement services. We won't replace your old central air conditioning unit unless it can't be repaired for an affordable price. In those cases where an ac replacement unit would be the best solution, we can provide top of the line ac replacement units. Name brands such as Bryant and Payne. Our certified, factory trained ac repair technicians can assist you in the sale and service of any heating and cooling system. Proficient Heating & Cooling services Plymouth MI and surrounding areas. We service all makes and models of air conditioning units. Residential ac repair and commercial ac repair. We carry a large assortment of ac replacement parts and should be able to repair your ac unit in a fast and efficient manner thereby saving you time and money. We specialize in furnace replacement and furnace repair. Whether your current furnace is working poorly or not at all, Proficient Heating and Cooling can repair or replace it! Older furnaces tend to be low efficiency and waste money as they run. A new high efficiency furnace can save you money in the short term and in the long run! We carry high quality Bryant brand furnaces and Payne brand furnaces. Because Proficient Heating & Cooling is a Bryant dealer serving Plymouth MI, we can replace your old, worn out furnace with a new high efficiency furnace at a lower cost than our competitors. Proficient Heating & Cooling also provides a furnace maintenance plan. Our plans cover all types of furnaces and provide yearly maintenance and check ups for a very affordable price. Yearly maintenance on your furnace can keep in running efficiently and prolong it's serviceable life span. Call Proficient Heating & Cooling today to inquire about our HVAC maintenance plans. We offer a residential and commercial maintenance plan. Proficient Heating and Cooling offers exceptional HVAC maintenance and service. Heating systems, central air conditioning units, whole house humidifiers and thermostats, Proficient Heating & Cooling services them all in Plymouth, MI. Let the experts in HVAC repair handle any problem you may encounter. We carry some of the best brands in heating and cooling products available. Some of the brands we carry are Bryant, Honeywell, Payne, Aprilaire, Carrier and many more. 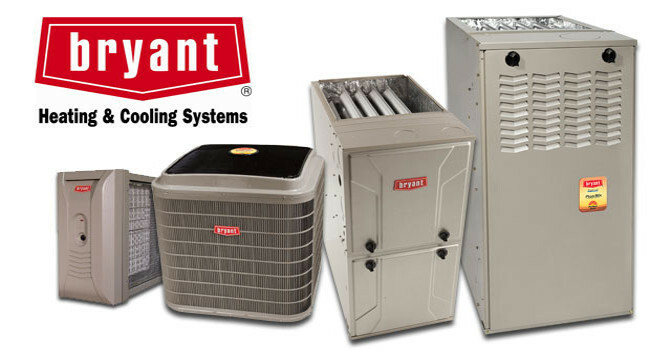 Being a Bryant dealer, we can provide a great new central air conditioning unit or furnace for a low, low price and still provide top notch service. If you live in Plymouth MI and need anything in heating and cooling repair, call Proficient Heating & Cooling. You won't be sorry! New AC Units, Furnaces, Whole House Humidifiers and More! We sell high quality, high efficiency furnaces, ac units, whole house humidifiers, whole house generators and so much more. Our prices are very competitive and our installation services are second to none. With over 23 years of experience in the HVAC industry, Proficient Heating & Cooling provides high end sales and service to all of our clients in the Plymouth MI and all of the surrounding areas. See our testimonials page to see some of our many satisfied customers. Customer Satisfaction is always our #1 Goal!